One year after protests at the University of Missouri, only a handful of student-athletes have followed in San Francisco 49ers quarterback Colin Kaepernick’s footsteps. One year after the Tigers football team initiated a boycott that resulted in the ousting of the university system’s president and its chancellor following several racist incidents on campus, there has been barely a rumble from America’s collegiate athletes. Now with the election of Donald Trump to the White House after a divisive and bitter campaign and eight years after many celebrated a “postracial” America, the Revolt of the Black Athlete 2.0 is needed now more than ever. Yet, while college students have been continually demanding change on their respective campuses, and young people have been at the forefront of protest throughout the nation straight through to today, student-athletes have remained at the periphery despite their long history of fighting for racial justice. Not that several student-athletes haven’t chosen to come off the sidelines. They, along with other accomplices, at 38 colleges and universities have joined Kaepernick in the national protests against police violence and the broader issues of American racism. Three women’s volleyball players from West Virginia Tech, a Tulsa football player, and several members of both the Amherst and Dickinson State football teams along with a number of cheerleaders from Howard University and University of Pennsylvania and members of the East Carolina University, Southern Methodist University and University of North Carolina bands, have joined the protests. They are not alone. Mara Green, a member of Florida State’s volleyball team, and Lonnie Welker, a member of the Indiana State football team, both have kneeled before their games. At Michigan and Michigan State, several football players have both kneeled and raised their fists in protest. Yet, despite these courageous stances, and notwithstanding the fact that historically student-athletes have been at the forefront of the revolt of the black athlete, challenging the injustices experienced on their campuses, and the broader place of racism, today we see a very different story. 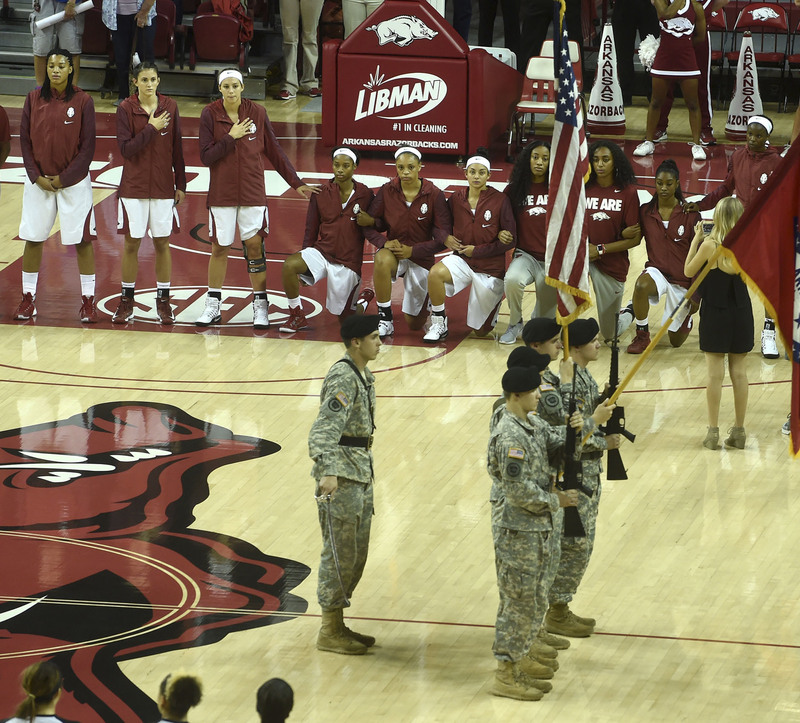 In this Nov. 3 photo, six members of the Arkansas women’s basketball team kneel during the national anthem before their exhibition game against Oklahoma Baptist in Fayetteville, Arkansas. Arkansas athletic director Jeff Long said the university is backing the six players. In an environment where several coaches, such as Jim Harbaugh (who did later back his players’ actions), Chris Ault, and Dabo Swinney, have made their opposition clear to both the methods and even the issues surrounding protests, and others have been vocal about a politics that may be less than supportive of #BlackLivesMatter, student-athlete protest is challenging. And who knows what messages coaches, who are often the most powerful people on campus, are delivering behind closed doors? Evident here, protesting student-athletes have to contend with the wrath and power of boosters, legislatures, regents, and other friends of the program, all whose power has increased alongside of the rise of the corporate university and collegiate-athletic industrial complex. Is this is the scary future that stands before us? The repression and the foreclosure of the rights of free speech? 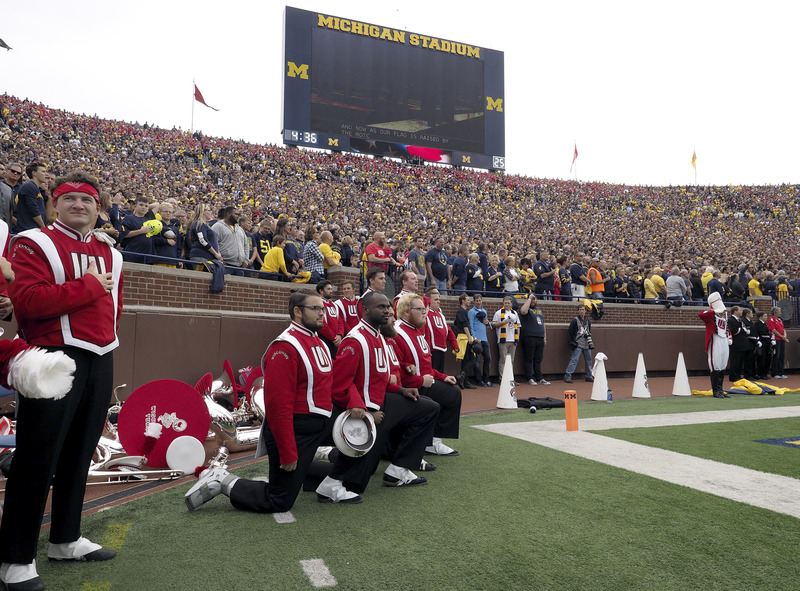 Four members of the Wisconsin Marching Band take a knee on the sidelines during the playing of the national anthem before an NCAA college football game at Michigan Stadium in Ann Arbor, Michigan on Oct. 1. 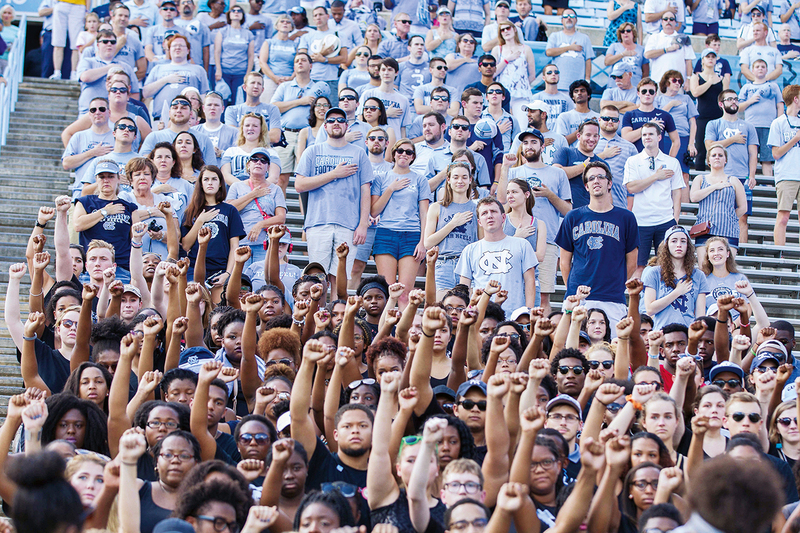 This fear of racial backlash, or as Van Jones describes, a “whitelash,” is the climate that black student-athletes are entering into as they kneel, raise a fist, or simply question the daily racism they experience on campus. While nothing new, in this environment where university presidents and coaches are more beholden to regents, donors, and other members of the 1 percent, where “alt-right” media websites and social media cultivate an avalanche of mistruths, student-athlete activism is increasingly more difficult. At Nebraska, their protest prompted rebukes from both the governor and a regent, demanding that they be removed from the team. In Missouri, a legislator proposed a bill that would strip student-athletes of their scholarships for “call[ing], incit[ing], support[ing] or participat[ing] in any strike.” Others have faced significant hate and threats of violence as a result of protests. Fear is real and understandable. “A lot of student-athletes have not protested because the system is designed for them to stay silent. You can’t have a successful exploitive economic system if you give the exploited labor opportunities to speak their mind and protest,” concludes Louis Moore, professor at Grand Valley State University. For many student-athletes, their futures, and the potential, if not promise, of a professional payday, are dependent upon their scholarships, which are renewable each year. Beyond threats to their immediate and long-term future, as well as the pressures to “shut up and play,” the structure of college athletics undermines the development of relationships. “Athletes are often separated from other students on the campuses of universities, especially those who play the big-money sports,” noted Jessica Luther in an email to me. “Student-athletes often have incredibly busy schedules, it’s not uncommon for them to live in student-athlete dorms, eat in student-athlete cafeterias, work out in student-athlete gym facilities, as well as have class schedules that have to work around their busy practice schedules.” For black student-athletes, the division between themselves and their nonparticipating black peers is real, undermining potential collaboration and a feeling of safety in numbers. North Carolina Tar Heels students hold up their fists during the national anthem in silent protest during the game against the Pittsburgh Panthers at Kenan Memorial Stadium. Never mind the narrative of student-athletes being “normal students” or the public being sold the idea that student-athletes are compensated with a college experience, collegiate athletics is built upon the separation and division, undermining potential protests. The culture of separation and the regulation of their lives online and within the community does not protect student-athletes, particularly those of color, from hatred and violence. And those participating in protests, whether at a campus march or on the field, face significant backlash, all of which are attempts at silencing them. Yet, black student-athletes don’t need to kneel or raise a fist to face backlash; black student-athletes don’t need to don #BlackLivesMatters T-shirts or tweet support for this cause to face hostility. As with their peers, the experiences of many black students at historically white colleges and universities are one of persistent racism. Rose-Ivey made this plain during his September news conference. To protest these injustices, and those that persist throughout the nation, is difficult. It requires time and courage. It brings threats of punishment and violence, hatred from those near and far, especially given the institutionalization of racial hostility made clear this election. And for all too many black student-athletes, these fears are felt each and every day, whether standing or kneeling, whether they raise a fist or hold their hand across their hearts, whether they protest or simply shut up and play. 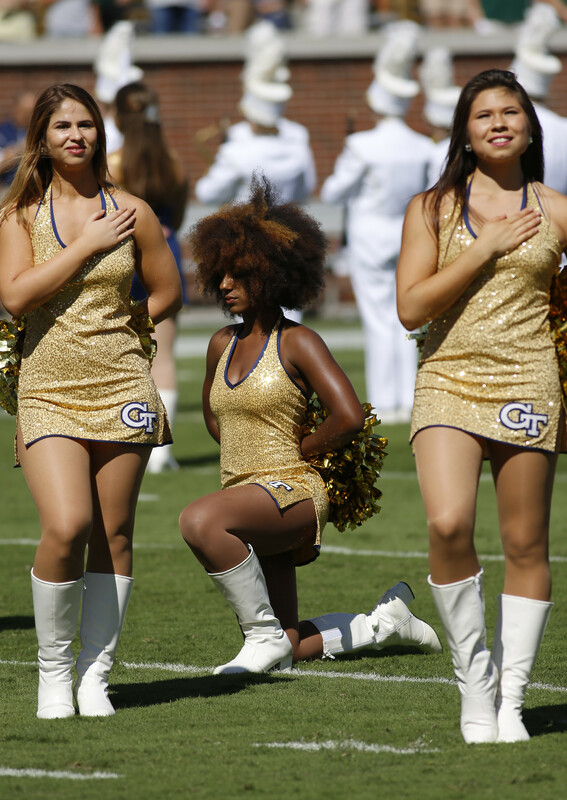 A Georgia Tech cheerleader kneels during the national anthem before the NCAA football game between the Georgia Tech Yellow Jackets and the Miami Hurricanes at Bobby Dodd Stadium at Historic Grant Field in Atlanta. Yet, as evident by the endless examples of racism on college campuses, as evidenced by the refusal of athletic departments and university administrations to address their campus’ climates, these demands are going unheard. Clearly, kneeling or tweets or publicly shaming is not sufficient. Organizing is imperative; the leverage and power rests in their labor and profitability within collegiate sports. But at the same time, it is imperative that we challenge ourselves, demanding that we do more to foster racial justice. Whereas student-athletes, black student-athletes, have so much to lose, as protesters or not, so many fans, professors, coaches, and political leaders, bathe in the power and privileges of whiteness. Will they use that to be silent, to aid and abet racial injustice or stand on the right side of history? Why aren’t fans standing up to other fans who yell slurs or legislatures who threaten black student-athletes for merely demanding that America, from the playing field to the White House, live up to its professed values? Why aren’t we demanding that if the culture at large is OK with white coaches and white athletes expressing their support for Trump and everything his campaign embodies, it is also OK for black student-athletes to stand up or kneel for their beliefs? Now more than ever we need more student-athletes speaking truth to power, and it cannot simply be black student-athletes taking the risks, but their white peers as well. Now more than ever we need coaches and administrators not simply supporting “their right” to speak but exercising their power to demand change. Now more than ever, we need fans to cheer for those who courageously fight racial violence but who refuse to sit in the stands so long as we are all not free. We must begin to stand with, kneel alongside, and otherwise protest alongside those who risk so much each and every day. The stakes are too high to sit while the incomplete walls of justice tumble around us. David J. Leonard is a professor at Washington State University. He is the author of After Artest: The NBA and the Assault on Blackness and coeditor of Commodified and Criminalized: New Racism and African Americans in Contemporary Sports.